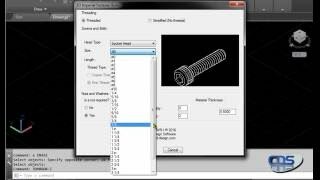 This is a powerful app for creating 3D Imperial screws and fasteners with a variety of head types in Imperial units. Each type of Head (Head Type) will offer a variety of available sizes and user-settable lengths. Select either a Threaded bolt with Fine or Course threads, or a simplified bolt, plus add a Nut, and choose from a variety of washer types (plus quantity) for the selected type of fastener heads. An extra setting is available to set the metal thickness to offset the nut and washer from the head. Create as many of the same fasteners as desired. Each object (screw, washer, and nut) is created as a separate ‘block’ in AutoCAD.